Home News Pretty Pet Salon iOS 1.9.1 – Downloadable bug fixes! Pretty Pet Salon iOS 1.9.1 – Downloadable bug fixes! We’ve been working hard to address some issues reported to us by our players, and that’s why this week’s update for Pretty Pet Salon iOS is all about bug fixes! Tap on the “Download New Levels” button on the main menu screen to see a list of Downloadable Content. 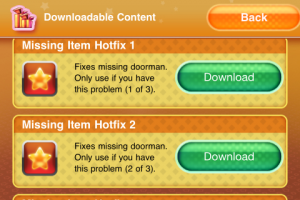 Find three (3) “Missing Item Hotfix” items in the list, and tap “Download” for all three. You can download these fixes in any order. 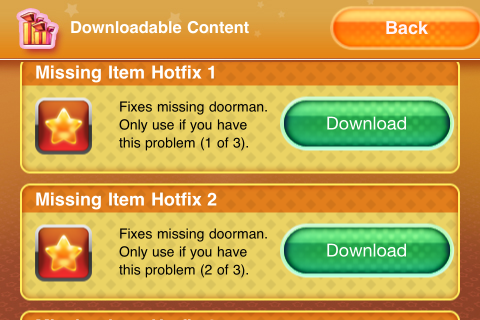 Remember that you only need to download these fixes if your Doorman has disappeared! Additionally, if your game crashes whenever the VIP Mr. Happy appears, you can visit the Downloadable Content page, find Mr. Happy again, and tap on the “Update” button. This version of Pretty Pet Salon includes some adjustments to the level requirements starting from Level 13. We’ve also addressed some performance issues, so the game should run more smoothly on older iOS devices. Finally, we’ve minimized the risk of the app crashing on the iPhone 3G and 3Gs based on data we’ve gathered from players. If you continue to experience crashing on your iPhone 3G and 3Gs, do let us know! Rest assured that we will continue to work on the improvement of our games. Thanks once again to all those who sent us their bug reports!